You’ll agree with me that lifting the engine from its compartment is one of the challenging strenuous exercises one can face. Engines are heavy – typically hundreds of pounds. Commercial auto-mechanics can haul your engine at an extra cost in addition to the repair costs. Why not do that on your own? With the best engine hoist you can safely haul the engine from your vehicle to get ready for maintenance. 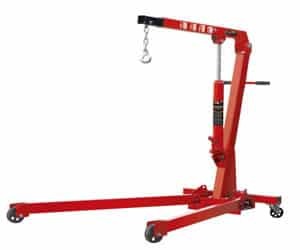 The best engine hoist, interchangeably called, engine crane, cherry picker or engine lift, is an indispensable tool that every motorist should have. No matter how good you think your car is, one day you might need to take out the engine to fix a certain component. 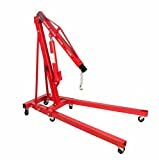 Dragway 2 ton cherry picker is one of the best tools to lift automotive parts such as engines and transmissions. It is painted with red color and the paint is oil and dirt resistant. 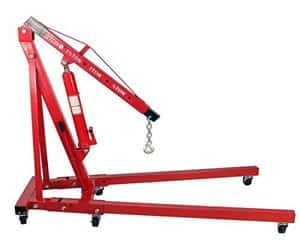 With this engine hoist, you can haul large engines to a capacity of 4000 lb without extending the boom and 1000 lb if you extend the boom further. That’s a sufficient capacity for any typical engine of standard cars because engines rarely weigh to that extent. When in closed boom capacity, you can lift the engine to a maximum height of 48 inches and 102 inches if in extended boom. What make this engine crane convenient in hauling engines are the 6 caster wheels which enable the crane to move to any storage position. They can rotate 360 degrees. Note that the crane is a hydraulic design, so it uses the hydraulic cylinder with low oil pressure to lift the motor. An 8 ton long ram has been included which you can control by inserting a pumping tool in it. It becomes easy to lift up the engine or to put it back in its compartment by controlling the hoist with the hydraulic ram. 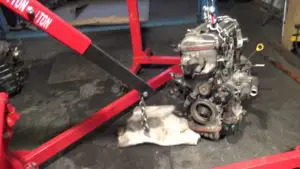 After you’re done with your engine hoisting, the tool is easy to fold and store it in your cluttered garage. With the folded dimensions 58 x 37 x 22 inches, you can store it in a compact area in your garage. At the end of the boom lie the 5/16” hook and the 12” forged steel chain which can attach with ease to the engine without loosening. Design-wise, the Dragway engine hoist is made with a premium steel construction that ensures durability and strength. You are assured that you will be safe while operating this tool. The main body consists of a thick frame with two supporting components so that it can lift the heavy tools with enough support. The hoist components are bolded, so it becomes easy to disassemble it or to fold it. Assembling of the tool is also easy with the user manual provided. 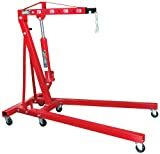 Dragway is a popular engine hoist for auto mechanics and hobbyists.With the capacity of 4000lb, it can lift many engines and other heavy auto parts. For this reason, I would recommend it for every motorist. Furthermore, it can save you costs because mechanics can charge you a lot to remove the heavy engine out of your car. As a DIY enthusiast, you can remove it easily with this tool. Besides, it is an affordable tool with lots of features and an eye-catching design. Boom Range: Floor - 102in. Now, the Dragway 3 ton engine crane is a real heavy-duty engine hoist for giant engines. With a capacity of 3 ton (6000lb), it can literally haul any kind of engine. If you drive large trucks or buses, this can be an ideal tool in times of need. It comes with the base, the frame and the extendable boom. Starting with the base, it is made of the thick premium steel that surely lasts for many years. Moreover, it resists corrosion, oil and grease because working with engines exposes you to oils and greases. But, unlike the Dragway 2 ton engine hoist, this one comes with 4 fully-rotational caster wheels for ease of mobility. This means you can haul the engine to any workspace. Then the frame is made of a thick frame with two supporting components on the sides. These are made to balance the engine crane because it hauls large engines. The boom is attached to the frame and has the hook and the chain at the end to attach to the engine. When extended, the boom can reach 87 inches and can lift a load capacity of 2000 lbs. But, in closed position the boom can haul a maximum load capacity of 6000 lbs. To ensure that the boom is capacitated to haul large engines without breaking, it is made with a thick 6 x 3-1/2 inches premium steel. The other advantage of the engine hoist is the extendable legs from 55” to 89”. This adds to the stability of the tool. When you’re done with your engine repair, you can fold the tool and store it in compact areas. It measures 30 x 57 x 65 in folded position. Folding it is an absolute breeze with the detachable pins and bolts. The overall design of the tool is long-lasting because of the premium steel construction. Even if left forgotten outside the garage, the downpour will not be a match to the water resistant components. The lead-free paint is oil and dirt resistant. If you worked with engines you would relate how dirty it can egt with grease and oil. Despite being an exorbitantly expensive engine hoist, it is worth an investment, especially for those with large engines. 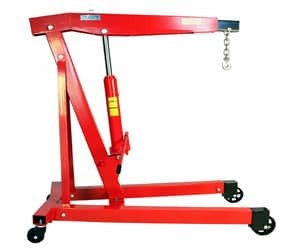 The 6000lb is an adequate capacity which guarantees a safer hoisting of the engine without subjecting yourself or your car to possible injury. I do recommend this tool for auto mechanics who are servicing a wide variety of vehicles. Because the boom reduces the load capacity when extended, you may find it helpful to opt for this 3 ton so that it reduces to 2000lb when fully extended. But such extra features come at a price. Torin Big engine hoist comes with a load capacity of 2000 lb (1 ton). Is it a bad choice? Not really! There are compact loads that need no large engine cranes to haul. 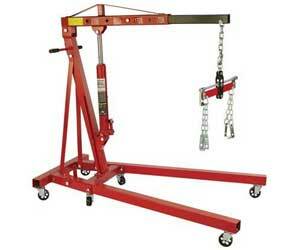 In such cases this engine lift can become very helpful to lift engines below 2000 lb. But the set back is when you extend the boom as the capacity can reduce to about ¼ of 2000 lb. Regardless of these setbacks; it is still a good tool to own. Colored in red, the engine hoist resists any dirt as well as engine oils. Even if you forgot it outside and got soaked in rain, it will not rust. The four-wheeled engine crane is made to last long with a high premium steel construction with the frame and the hydraulic jack to lift the load. When operating it, you have to maneuver the hydraulic cylinder. The lifting range is 1 inch to 78-3/4 inches. Because it is suitable for smaller engines, the company saw it unnecessary to fit 6 wheels but 4. They are still mobile and can rotate to any direction you take the load to. What I also found convenient like the two aforementioned engine hoists is the foldable design. In most cases car owners are hesitant to buy engine cranes because of the limited storage in their garages. With this one you can rest assured of a compact folded design. To unfold it you just have to detach the pins. To assemble this engine lift shouldn’t take you longer than 30 minutes. Even a 15 year old can easily assemble the crane with the chain and hook provided which you can attach to the engine with ease. The good thing with foldable designs is that you only assemble it once, so you do not have to disassemble it frequently. The setback I noticed with the tool is that, despite being a lower capacity crane, it is highly priced than the first product I reviewed above with the higher capacity. That’s where the effect of branding comes in. 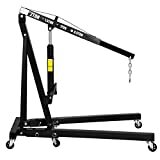 If you plan to haul smaller though heavy items, this engine hoist is for you. It is a compact tool that is easy to assemble and to fold for ease of storage. The steel construction makes it long-lasting. The entire body is made of steel. That’s a plus advantage. But, if you’re looking for more capacity, I would reckon you consider the Dragway 2 ton with a relatively cheaper price than this tool. Nonetheless, this tool is still a good and compact tool particularly for smaller engines. Here’s an advanced engine lift than the preceding 1-ton tool. With Torin Big Red cherry picker, you can haul to a maximum capacity of 2000 lb. Further than that, the boom has 4 holes to accommodate different capacities. Consisting of the main frame and the two supporting pillars, the engine hoist is made to endure lots of forces when hauling larger engines. At the end of its boom are the hook and the chain which help level the engine when lifting it. The chain is strong enough to last long. Adding to the balance as well as controlling the boom is the 8 ton long ram. It is also sturdy to give massive support to the hoist frame. The boom can lift with a range of 1 inch to 78.75 inches. When repairing the engine, you may want to take it out completely of the car. That is made possible with the 6 caster wheels for mobility. You can pull the engine crane to any position. If you are done, you can simply control the boom using the hydraulic ram to put the engine back safely in its compartment. If you’re done with hoisting, you do not have to disassemble but fold the design for ease of storage in your garage. That’s a plus advantage with modern engine hoists which phased out the unfolded older designs. But the unfolded designs still exist especially for commercial workshops where the storage space is ample. A thick steel construction is used to make this tool durable. As long as you use it within its load capacity, it can last for many years without breaking. It is painted in red and made to be resistant to dirt and oils. Despite not having an extendable boom and extendable boom, this engine hoist is the best compared to the preceding 1-ton engine crane from the same company. On top of that, it has 4 holes for different capacities. Instead of buying the 1-ton engine lift, I would recommend opting for this one. It is the best buy. And it has all the features you need such as 6 wheels to move the engine around and the folded design when you’re done repairing the engine. Strongway Hydraulic Engine Hoist is the last product on my list of the best engine hoists. 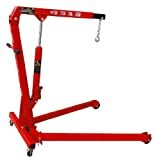 The first noticeable difference with this tool is the included 1500 lb load leveler which ensures stability of your engine when lifting it. The leveler actually reduces the effort of hauling your loads. The lift range of the boom is 1 inch to 82-5/8 inches, which is much better than many on the market. With the load capacity of 2-ton, it can haul to a maximum capacity of 4000 lb. The entire body is constructed with the high-grade stainless steel, which meet durability standards. It makes it rugged to lift large loads without any fear of breakage. Also its hydraulic jam is constructed with the premium steel of a large diameter to help support the hoist. The cylinder operates on a lower oil pressure to move the boom around in hoisting the loads. The tool is painted with a lead-free paint, which protects it against dirt, oil, grease and outdoor elements. So, even if the tool gets soaked in rain, it will not rust. All the components are well-painted to prevent rust. If you’re concerned about the safety, this engine hoist has ensured maximum safety of use. Firstly, the engineers have ensured that the safety and performance meet international standards. The included leveler has 4 chains which add more credit to the safety. The engine will not slip off by any mistake because of the support bracket. Regarding the versatility of its boom, it has 4 holes to accommodate for different capacities. The holes match with capacities ranging from 1000 to 4000 lbs. It is easy to adjust the boom. If you are looking for an extendable boom, this is not for you. Together with its 6 caster wheels, the compact body makes this engine hoist maneuverable to any position. The wheels can rotate to move the loads to a different workspace than the compartment in the vehicle. After using the engine lift, you can fold it to store in your garage, regardless of not having an ample space. To add on resistance, the hydraulic jam has the high quality oil, which helps in protecting against corrosion. It also enables the tool to operate in irregular temperatures. What impressed me with this engine hoist is the inclusion of the load leveler which helps in stabilizing the load and ensures maximum safety. Operating engines has never been easy because they are heavy. If not handled safely, they can damage the car or you in a process of lifting them. Strongway hydraulic hoist has made things simple.Furthermore, it has a 4-hole adjustable boom position. This makes it easy when hoisting different capacities. Thanks to the high-grade steel construction because it guarantees durability of this engine hoist. What is The Engine Hoist? What to Look for When Purchasing The Engine Hoist? How to Lift The Engine Using The Engine Hoists? I have reviewed the best 5 engine hoists on the market above. It may seem pretty narrow to this end, but can still be daunting to pick the best one. Instead of relying on my verdict, I found it necessary to help you spot the important aspects before making purchases. 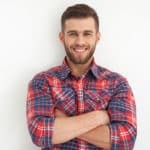 In this buyer’s guide I will delve into the important factors you need to know as well as demystify the important terminologies. 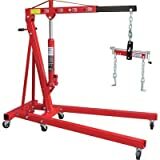 Engine hoist is a tool that is used to lift heavy engines from their compartments. The tool helps when repairing engines or changing them. It comes in different designs and weight capacities. Hydraulic engines are the popular ones and that made me review only the hydraulic engines above. 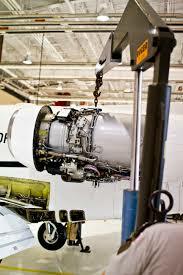 Having the best engine hoist can save you lots of costs because mechanics charge to remove the engines for you. Before buying the engine hoist, you need to consider some important aspects. These include the weight capacity, the adjustable boom, the number of wheels and other accessories such as the hook and the chain. Also worth considering is the design type of the tool. This is arguably the foremost important factor to consider. Normally, engines are huge because they weigh hundreds of pounds. Lifting them with your hands is a mammoth task. But still, handling them with engine hoist does not exempt you from possible injuries. If you are using a smaller engine hoist, like the 1-ton tool in our reviews to haul the engine of the truck, you might subject your car to damages or even damage yourself. That being noted, you should be careful of the weight capacity. Consult your vehicle manual to find out the engine weight and then purchase accordingly. In my reviews I have highlighted the maximum capacity of each engine hoist. Important: the further you extend the boom, the lower you reduce the weight capacity. A closed boom, for example, can have a capacity of 4000 lb and when fully extended have a capacity of 1000 lb. It’s important to note this in your hoisting. Some engine hoists have adjustable booms with 4-holes to accommodate for different capacities. For instance, a 4000 maximum capacity can have holes with 3000 lb, 2000 lb and 1000 lb capacities. If you have adequate budget, I would recommend you consider such engine hoists instead of restricting the weight capacity. Generally, engine hoists come with a variety of weight capacities even more than what I have reviewed above. I have already highlighted the importance of the adjustable boom with different holes for varying capacities. The boom is convenient if you are a mechanic servicing different makes of cars with different engines. Even for a DIY hobbyist to hoist different auto parts other than the engines, it is still helpful. You need to consider that. But, usually, adjustable booms, as seen in my review, are rarely extendable. So, if you’re looking for an extendable boom you may want to consider the non-adjustable ones. In some cases, there are extender accessories for non-extendable booms. Either way, note that extendable booms come with reduced weight capacities. Generally, there are 2-wheeled, 4-wheeled and 6-wheeled engine hoists. The 2-wheeled ones are not popular due to lack of stability when hoisting heavy engines. The 4-wheeled engine hoists, on the other hand, are popular on the market and are stable. The wheels can rotate 360 degrees so that you can move the tool around. However, the 4 caster wheels are not as stable as the 6 caster wheels. In my review there is a combination of 4 and 6 wheels. Obviously the 6 wheels are more suitable for larger engines and more weight capacities. The important thing with the wheels is the mobility and the maneuverability of the engine lift. Other accessories may include the hook and the chain used to attach to the engine and remove it from its compartments. Without the load leveler, you may have to put more efforts in stabilizing the engine. Fortunately some tools come with the load leveler and multiple chains to stabilize the load as well as to improve your safety. Single chains are not necessarily bad, but require efforts and care to handle the engine. So, choose well or add extra accessories to the single chained engine cranes. Although price is not necessarily an important factor, it is necessary factoring it in as well. From my reviews, the average price of these engine cranes range in the middle range, especially those with 2-ton weight capacity. The 3-ton engine hoist costs obviously a bit more. That is a heavy-duty engine lift suited for large vehicles such as trucks and buses. The important consideration, however, is the quality of the tool over the price. 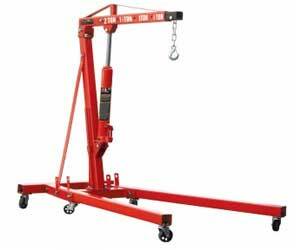 With reference to my reviews, a 1-ton engine hoist of Torin Big Red costs more than a 2-ton engine crane of Dragway. If I were to choose, I would opt for the 2-ton weight capacity of Dragway. In some cases, pricing goes hand-in-hand with the brand of the tool. Which should you consider? It depends on your preference. Generally, there are three basic designs of engine hoists and these include hydraulic, chain and electric. Each has its advantages and disadvantages. In my reviews I have only considered the popular hydraulic engine lifts. – as the name implies, they use the hydraulic cylinder with the oil pressure to move the motor around. You have to pump the hydraulic jack to increase the fluid pressure to move the boom up and down when hauling the engine. The tools have larger weight capacities than the other designs. On the bad side of the tools, they can take longer to fully remove the engine, but not as slow as the chain engine lifts. Hydraulic engine cranes typically have the base, the frame and the boom, and are mostly made of the high-grade steel. Moreover, hydraulic engine hoists roll on casters. This makes it more mobile and versatile compared to other designs. You also have a choice between foldable and non-foldable designs. Again, because the roll on casters, you need a flat surface so that the engine is balanced. Otherwise the weight of the engine may cause the crane to fall. Price-wise, hydraulic engine lifts are affordable compared to electric designs, but expensive compared to chain designs. There is not much of maintenance required on these hydraulic designs. – these engine cranes use the chains and the gear system to lift the loads. They operate manually, so you must be prepared to exert so much force on the tools. The chain will typically activate the gear system which will then start lifting the engine. The chain engine hoists are the least expensive of them all. But, you have to mount the tool to a fixed point above your vehicle. This restricts the mobility and versatility of the tools. That’s why they are not popular among DIY hobbyists. Again, they are not designed to endure a weight capacity over 6 tons and the tool is slower than the electric and hydraulic engine hoists. Its advantages though: it takes less space and it is less expensive among them all. – these are the most expensive ones, but also the quickest. Because of their expensive price tag, they are the least popular. But they are usually found in warehouses and factories, and even the mechanic workshops. Despite being electric, they still need chains to lift the engines. No manual operation, but a remote-controlled motor which lifts the load. Because of this remote control, electric engine hoists are the fastest. But they still need the fixed point to attach them. Hydraulic engine lifts are still victorious in terms of mobility and versatility because they can roll with ease on the casters. Generally, engine hoists, particularly the hydraulic, can take up more space in your garage. This is a case when you have the non-foldable design. Because of the need to make compact designs to satisfy the needs of DIY hobbyists, manufacturers have opted for foldable designs nowadays. There are pins to remove when folding the frame for ease of storage. Motorists should not complain about the lack of storage in their garages anymore. How to Lift the Engine Using an Engine hoist? Having the best engine hoist does not necessarily mean one can successfully haul the engine out of its compartments. There are certain safety measures you need to take into account. Firstly, ensure that the tool has a rated weight capacity suitable for your engine. Consult the user manual for more guidelines on how to use a specific product. Watch the video to see how the engine is being lifted out of the vehicle using the hydraulic engine cranes. This marks the end of my review of the best engine hoists on the market. I reviewed the 5 top products which I believe can be the right tools for a variety of vehicles. Among others, the 2-ton engine lift is the most popular. It has a weight capacity of 4000 lb. Notwithstanding the refined top 5 products, it can still be daunting to pick the best among them. I have therefore provided you with the buyer’s guide, in which I have highlighted the important aspects worth considering before purchasing the best engine hoist.